A car-friendly guide to the future of transport in New Zealand, written for non-technical readers by a car enthusiast and manufacturing engineer. If you want to fix transport-related greenhouse emissions, ask an engineer who actually LIKES cars. Science clearly shows that humanity must totally stop pumping fossil carbon dioxide into the atmosphere. From Smoke to Mirrors is the first book to fully investigate practical solutions. 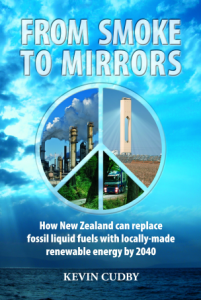 From Smoke to Mirrors brings together information and analysis from New Zealand and overseas engineers and scientists. Written by a former manufacturing engineer who now specialises in writing about technology for non-technical readers.